It took 4 hrs 45 minutes from leaving home in Bedfordview to cover the 482 kms to reach the Phalaborwa gate driving via Witbank, Dulstroom, Lydenburg, Ohrigstad through the magnificent Abel Erasmus Pass to the mineral rich Phalaborwa area. This whole area is a geologist’s paradise and is home to many of the earth’s most precious and rare minerals. The rock formations seen on the way to Phalaborwa have to be seen to be believed. It was a gorgeous early Spring day and I was looking forward to the leisurely drive on the sand roads to Letaba Camp where I would stay for 2 nights. As is the case for all drive pages on this site the map below highlights the route taken and described on this page. It also shows the various waypoints marked using GPS positioning. To enlarge the map just click the thumbnail … this will open the larger map on a greyish black backround … to get back to this page click anywhere on the large image. The temperature was 27 degrees Centigrade, sunny and clear. The veld in this area was still very much in its winter colours, and extremely dry as is usual. The area was dotted with many termite nests. Termites prefer the well drained granite soil structures that occur in this region more so than other other areas of the Park although you will find such nests anywhere in the Kruger. It’s just that there are so many here it’s hard to believe. Much of the research on termites has been carried out in the region. 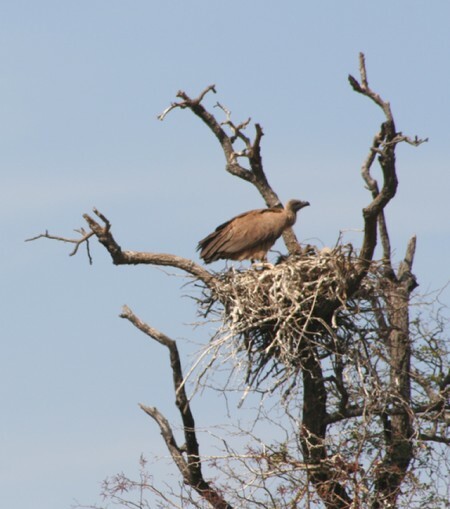 Waypoint 395 was the first marker and it indicates the turn off onto the S131 (and 52 kms to Letaba) and within a couple of kilometres I saw, for the first time ever, a nesting Vulture to the right hand side of the road. The Vulture was standing on the edge of the nest and every so often a small white head would pop up (see right hand side of the nest) and mom would lovingly bend down to take a look at this young Vulture chick and say “My, you are really beautiful! I do love you so much”. 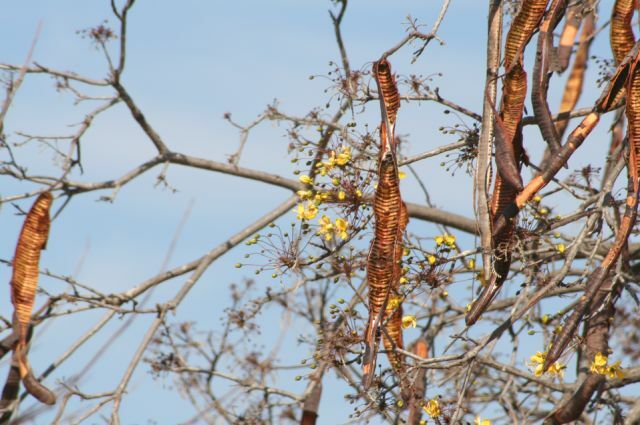 I hadn’t been driving long when I saw one of my favourite small trees with a wonderful common name … The Sjambok Pod. You will understand when you take a look at the extremely long pods (empty of course at this time of year) on this tree. The pods have been measured at up to almost 1 metre. The tree was mixed with a few early bright yellow blossoms and was not yet showing the brilliant green leaves that it will soon be covered with. It is truly a startling tree when covered in blossom and again when showing its fresh leaves … later in this trip I would see many splendid specimens and have taken photos of the tree in all stages. The seed of Cassia Abbreviata, its real name, are food to many birds and brown headed parrots in particular are expert at opening the pods and removing the large nutritious seeds. 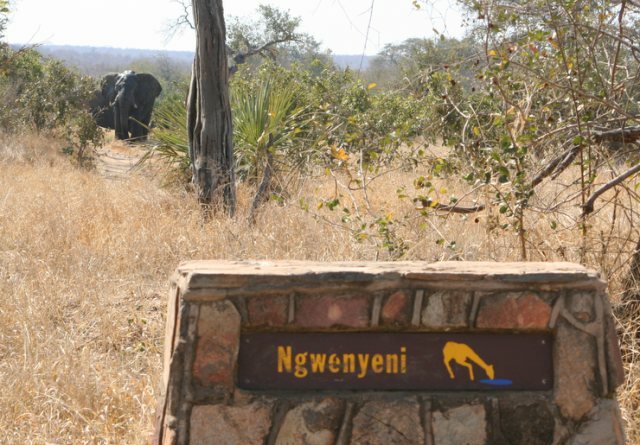 Waypoint 396 is the Ngwenyeni watering point where elephants were drinking from the concrete circular trough as they like to do (the water is probably cleaner and suits them better). The trunks are cast over the wall into the water so that it appears as if a hose has been attached to the elephant. A little further down the road a group of elephants were coming towards the road from the watering point and they became aware of my presence. The wind was blowing south to north towards the elephants and from their cautious behaviour it was clear they sensed my presence and not by sight alone. Waypoint 397 is the junction with the H14 which road I crossed to continue on the S131 sand road towards waypoint 398 which is the location of the Shivulani watering point. There was a family of Elephants close by the dry river crossing. 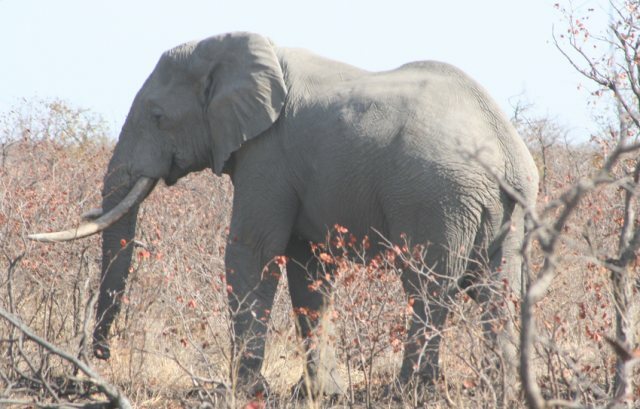 This picture of a good sized Elephant bull with large tusks was taken at waypoint 400 to show the contrast between summer and winter in the Kruger National Park. See how dry and bare the veld is and how stark the landscape looks made worse by a cool fire having passed through the area. It will change as it does every year. There were Zebra and Impala in the area. Shortly after this sighting waypoint 410 marked the next road junction. Here I turned off the S131 to complete the short S132 (Marhumbyeni Loop) . At waypoint 402 on this short sand road stretch was the Marhumbyeni watering point a few hundred yards off the road to the left. It was close to here were I came across 2 Crowned Lapwings why started to behave in a way I recognize as being that meant to deter intruders from discovering a nest … they started calling out loudly and walking in opposite directions away from the probable nest area. And sure enough shortly after that 2 small chicks came into view. They then made off to join their parents and all 4 walked off further into the bush. A delightful sight. Waypoint 403 is the junction with the main H14 which I would continue on until waypoint 404 some 10kms away at which point the S96, Shilawuri Loop sand road started and more importantly it marked the magnificent Shilawuri Koppie. The Shilawuri hill or koppie at 414 metres above sea level was covered with trees in bare winter silhouette against the eastern sky. This hill is an example of a basalt outcrop in a granite area and is better known as Gabbro. I completed the S96 and turned around at waypoint 405 to be able to complete other loop drives closer to Letaba. I would complete the S131 roads tomorrow. 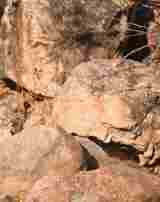 Waypoint 406 is an example of what is called Grey and Pink Granite or Gneiss Rocks “cut by light coloured pegmatite veins”. Pegmatite - A very coarse-grained igneous rock type, usually found as dykes or veins, and commonly composed of quartz, feldspar and mica. Gneiss - A coarse-grained metamorphic rock having banding of alternate light and dark minerals (gneissosity). Reference http://www.nr.gov.nl.ca/mines&en/geosurvey/education/terms.stm Maybe the picture here will at least help to explain. 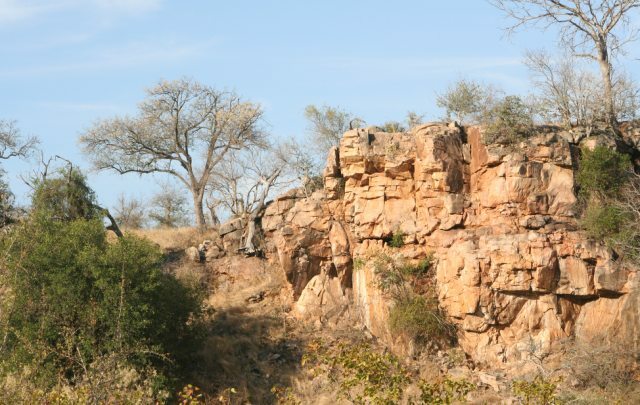 The point is just to bring home once again the rich geological formations within this part of the Kruger National Park. Waypoint 408 was a beautiful late afternoon shot of a cliff face in magnificent sandstone type colors. Close to the cliff was a blossoming Knob Thorn tree (Acacia Nigrescens) standing proudly to attention and guarding the path down to the river. Although not shown on this photograph just to the left of the tree was a completely different rock stucture classified as “dark green and black Greenstone outcrops”. Greenstone, also known as greenschist, is a non layered metamorphic rock derived from basalt, gabbro or similar rocks containing sodium-rich plagioclase feldspar, chlorite, epidote and quartz. Chlorite and epidote give the green colour … reference Wikipedia. Waypoint 409 was the turn-off to the S69 short loop road running alongside the Nhlageni River. I came across a large herd of Buffalo grazing peacefully close to the river and stayed awhile in their company. Waypoint 410 was another crossing of the river and this time I stopped for a while to listen to the silence, and view the solitude and magnificence of the Kruger before starting the car again to complete the short distance to the Letaba Camp.